Fresno’s professional franchise, Jose Ramirez, is set for another world title defense homecoming. 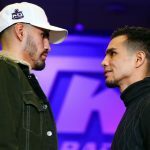 Ramirez (23-0, 16 KOs) will seek to make the second successful defense of his WBC super lightweight world title against Jose “Chon” Zepeda (30-1, 25 KOs) on Sunday from the Save Mart Center in Fresno, Calif. The post Jose Ramirez Readies for Second World Title Defense appeared first on Round By Round Boxing.